The image above is a TWA advertisement from 1963. The ad features some great paleo-future design and can be found in the book The Golden Age of Advertising - The 60s. 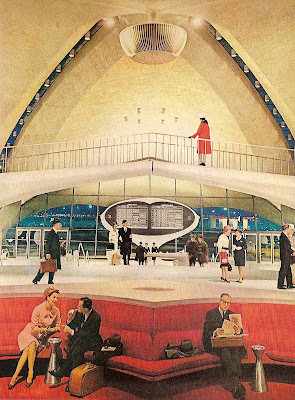 Isn't this a picture of the inside of the TWA terminal (terminal 5) at JFK? It is currently vacant but was used for the filming of "Catch Me If You Can". Yeah, I'm pretty sure that's about how it looks. It was designed by Eero Saarinen. From outside it sort-of looks like a bird - it's supposed to feel light and flight like. Just to confirm: yeah, that's a straight and uninflected rendition of the Saarinen Terminal 5 interior. This is what it looks like these days, as it awaits rebirth as jetBlue's NYC hub.